Getting a loan can be very frustrating. All the red tape, the requirements and the hustle one needs to go through to secure bank’s approval for a personal loan can make the experience very stressful. For OFWs who have businesses in the country and need a loan to grow your enterprise, the fastest way to get it is by a Citibank loan. For employed applicants who need the extra cash to pay tuition and other fees, Citibank offers a very quick processing time to get your loan approved. One of the quickest ways to get a personal loan is to apply it at Citibank Philippines. 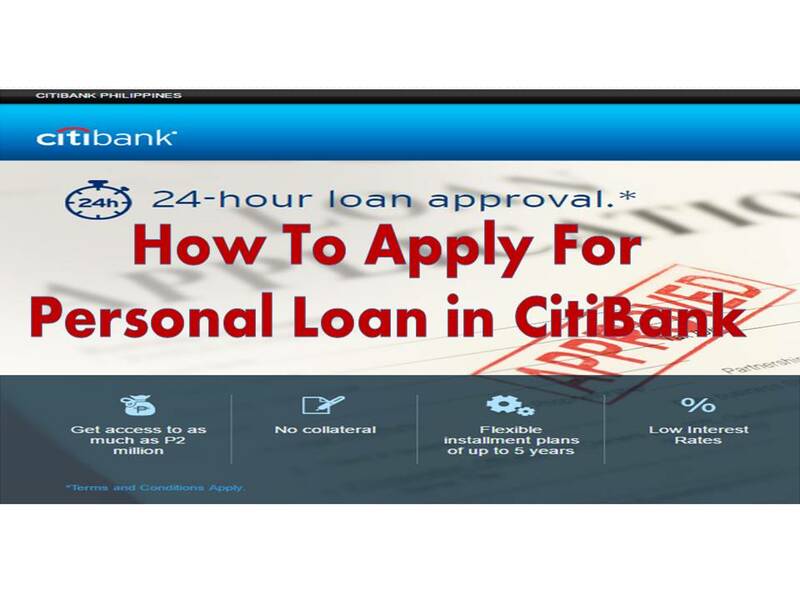 Citibank Philippines offers the quickest processing time for personal loans – only 24 hours! Whether you are a self-employed individual, an employed individual or an OFW who needs extra cash, Citibank Philippines’ personal loan program is the easiest way to go. How much can I borrow and what are my monthly payments? a. Know how much you can afford to pay. Check your monthly payments for every loan amount using Citibank Philippine’s online loan calculator at https://www.citibank.com.ph/gcb/loans/loan-calculator.htm. b. Citibank Philippines offers loans to as much as Php 2 million. a. Submit your application via this online form in Citibank Philippines’ website: https://www.citibank.com.ph/global_docs/1click/personal-loans-apply-now/index.htm?s=DGSEARCH&ecid=PSGODPHPLAENBC&media=8c4ec9ae-fc1c-1469179247&gclid=CjwKEAjwiMe8BRD0ts3Vtv-ohWgSJAAZurk1QpMD0xZ5u-f7rGQDKjKw3SAOIZ73YgUUf-ZwpNPcRhoCtE3w_wcB. The form will only ask you for your name, contact numbers, email address and annual income. b. Upon submission of your application, a loan officer from the bank will contact you via phone call within 3 hours. The loan office will then send you the application form and a list of the required documents to your email address. a. Once all the documents have been submitted to the loan officer via email, wait for your approval via phone call within 24 hours. The payment of the loan is via issuing post-dated checks. The best part is that you will only issue all post-dated checks once. For example if your loan is for a term of 60 months, you will only need to issue all 60 pcs of checks once.